Ernie Bushmiller had been writing and drawing the adventures of Fritzi Ritz since 1925, a strip about a Jazz-age flapper/movie actress, her film career and love life. He introduced the squat, slot-nosed Nancy in 1933 as one of the many guest stars who featured for a few weeks before fading out, but the joke opportunities she provided didn’t fade. The little girl stuck around, becoming increasingly popular and by 1938 Bushmiller’s daily strip was officially rechristened Nancy. 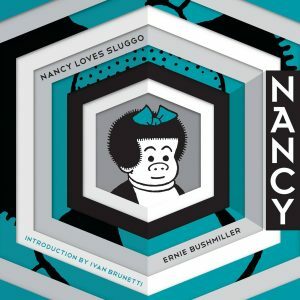 Aunt Fritzi was relegated to a supporting role behind Sluggo Smith, Nancy’s pug-nosed sidekick. The rebranded strip grew to become a huge phenomenon, syndicated in over 450 newspapers in the USA that decade (eventually 880 papers by 1971) and translated into hundreds more worldwide. 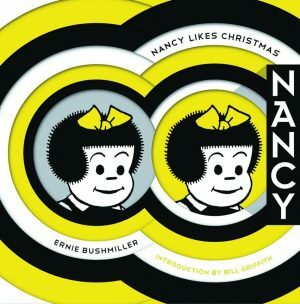 Nancy’s world of jokes derived from props, puns, upended clichés, and visual/verbal puzzle-solving is so purely graphic that it somehow manages to be simultaneously dumb gags and astonishingly razor-sharp cleverness at the same time. Bushmiller’s relentless focus pares everything down to the minimum information necessary to get to the punchline, and Nancy became more minimal over the years as he pursued economy of thought and expression by reducing and refining his drawings to the point where by the 1960s they were virtually just a range of beautifully iconic symbols. 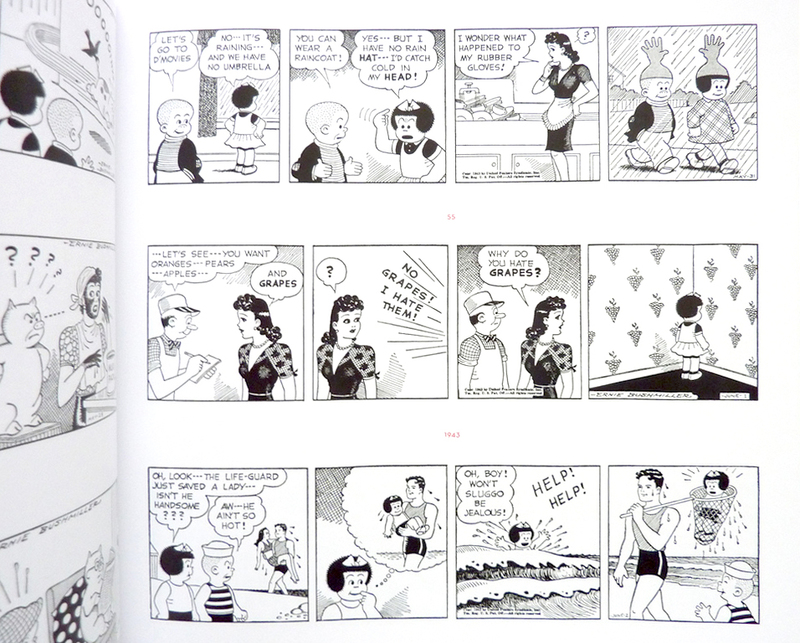 Nancy has been running for so long, and is so easy to excerpt in weird pieces because it’s so visually striking that it’s quite hard to get a sense of what the day-to-day strip was like, so these reprints are very welcome, placing the series back into its original context. 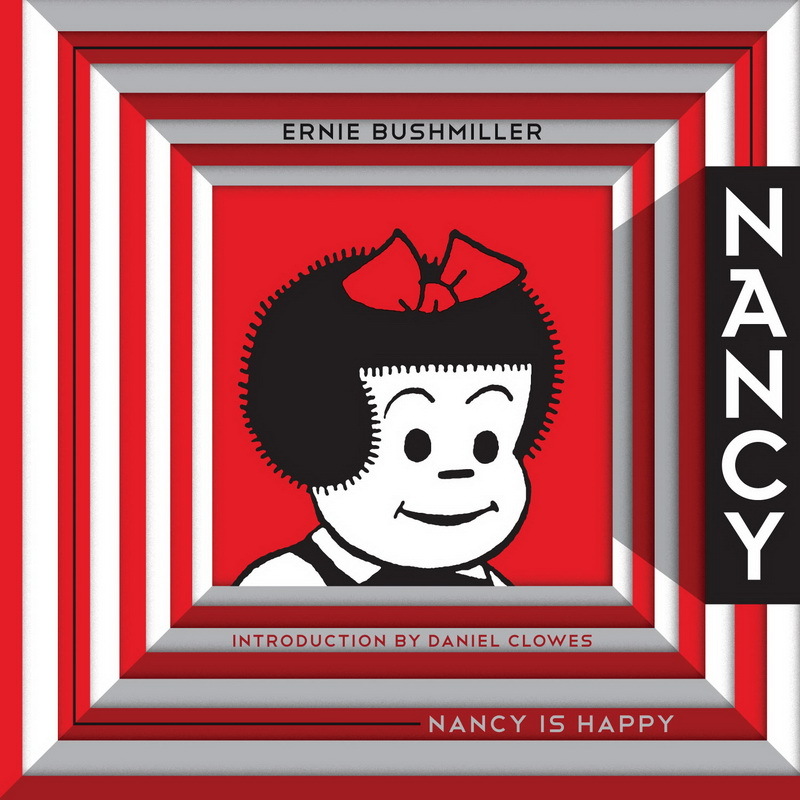 Nancy is Happy is the first in an ongoing series collecting every daily strip of Ernie Bushmiller’s almost impossibly minimalist humour comics in a 336-page square book format, each one beautifully designed by Jacob Covey. At least, it was meant to be ongoing. 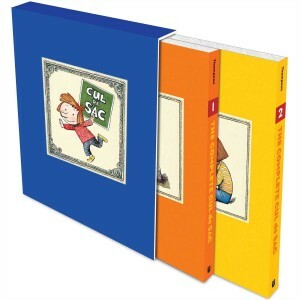 Only three volumes of this series have been published so far, the last one back in 2014. This first volume begins in 1942 because that was the earliest year Fantagraphics could find tearsheets for, from the collection of Dan Clowes, who writes the introduction to this volume. At this point the strip is pretty much a superior domestic kids-will-be-kids comedy with glamorous Aunt Fritzi and her long-suffering neighbours, the Sputters, caught in the middle. There are plenty of topical references that root it in its time period, not least of those being World War Two anti-Japanese racism, humour derived from slanty-eyed Chinese and sundry jabs at other foreign types. As the war nears its end those kinds of jokes thankfully go with them, although Nancy is still fretting over international relations by the end of this volume when Sluggo learns French to date a new foreign girl. If you want to understand what Nancy is all about, the Bushmiller of Nancy is Happy has not yet refined his art to the abstracted symbolic perfection we associate him with. 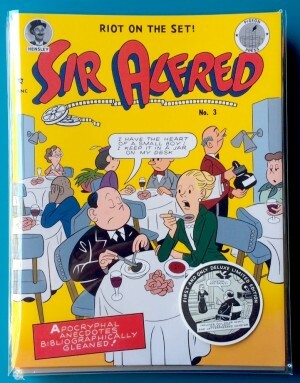 The timeless, impossibly every-place-and-nowhere-in-particular feel of the strip’s 1950s period hasn’t arrived yet, so this first daily collection isn’t the one to begin with although it is still a fantastic array of imaginative humour that is pretty funny some seven decades later. Nancy is Happy is now out of print, and copies fetch high prices. Unless you are a really devoted Bushmiller fan, the second and third volumes of this reprint series are much easier to find and consistently funnier so you can let this one go and pick up one of the others instead. Nancy Likes Christmas is next.